Compact Combination Microwave Oven, Microwave 1.00kW/Grill 2.00kW, capacity 50L, 50° - 250°C, 60cm, Black CIRCOGAS / FAN WITH LOWER ELEMENT In gas ovens the fan distributes the heat quickly and evenly throughout the oven cavity, avoiding flavour transfer when cooking a number of different dishes at the same time. 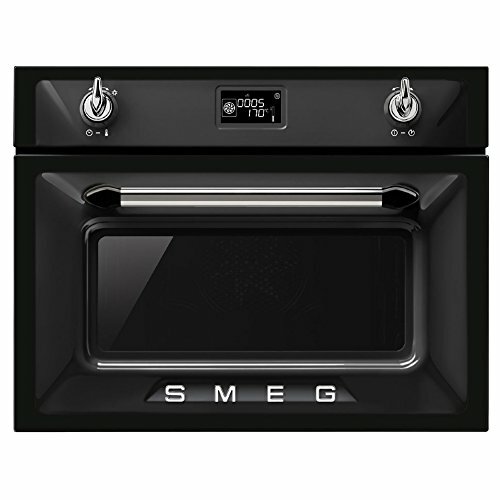 In electric ovens this combination completes cooking more quickly of foods that are ready on the surface, but that require more cooking inside, without further browning. Fan with upper and lower elements The elements combined with the fan aim to provide more uniform heat, a similar method to conventional cooking, so pre-heat is required. Most suitable for items requiring slow cooking methods. UPPER AND LOWER ELEMENT ONLY A traditional cooking method best suited for single items located in the centre of the oven. The top of the oven will always be hottest. Ideal for roast, fruit cakes, bread etc. Circulaire The combination of the fan and circular element around it gives a hot air cooking method. This provides many benefits including no preheat if cook time is more than 20 minutes, no flavour transfer when cooking different foods at the same time, less energy, and shorter cook times. Good for all types of food. CIRCULAIRE WITH UPPER AND LOWER ELEMENTS The use of the fan with both elements allows food to be cooked quickly and effectively, ideal for large joints that require thorough cooking. It offers a similar result to rotisserie, moving the heat around the food, instead of moving the food itself, enabling any size or shape to be cooked.